Probiotic cleaning – an alternative to chemicals? I was interested to come across “Probiotic Solutions” cleaning product. With 3 kids to clean up after and an Airbnb business on the side, I spend quite a bit of my time cleaning. We use very environmentally friendly cleaning products for our own health, but also because we are on a septic system. Anti-bacterial chemicals or bleach would ruin the balance of our septic tank. We would have a smelly situation on my hands. I am very familiar with probiotics from a food and supplement point of view, but was intrigued by the thought of spraying them round my home! Firstly, I wanted to review the scientific evidence. There have been a few studies now looking at the efficacy of probiotics as a cleaning solution. One study in 2014 used Bacillus bacteria, and compared to conventional cleaning products in 3 European hospitals. The study lasted for 6 months. It demonstrated that the probiotic cleaner was as effective as conventional cleaning products at reducing the levels of pathogenic bacteria on the surfaces cleaned. Two years later, some of the same authors took their research further. This time, the results showed that not only did the probiotic cleaning solution reduce the number of pathogens on the surfaces, it also reduced the number of drug resistant species. This is so important in hospitals now, where drug resistant infections are a huge problem. One of the mechanisms of action is thought to be a disruption of biofilm. Biofilm is basically a big community of bacteria that all support each other, and is very difficult to break down. 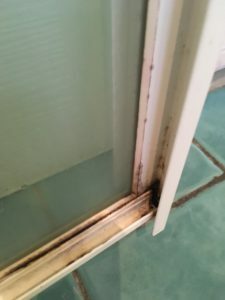 That is why these cleaning solutions work so well on grout, where a community of microorganisms turn your lovely white grout black. After using probiotic cleaning solutions, bad bacteria numbers increase slower than with chemical cleaners. I am taking that to mean I don’t have to clean the bathroom as often. Now satisfied with the scientific evidence, I was ready for the practical test. Luckily one of my showers was ripe for a bit of cleaning. The photos say it all. 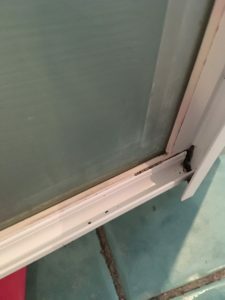 The first photo shows what the shower door looked like before. I bit black and gunky. I sprayed on the “bathroom bliss” and went and did other jobs for 20 minutes or so (thinking about that biofilm disruption!). Hey presto, it wiped clean pretty much straight away. 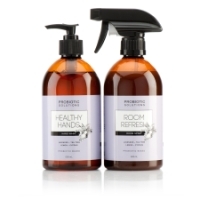 We are now using all the products in the range, from hand wash to air spritzer. I’m a nerd, but not so much that I have started swabbing surfaces round the house, or my children’s hands, so I can’t provide any hard scientific evidence!